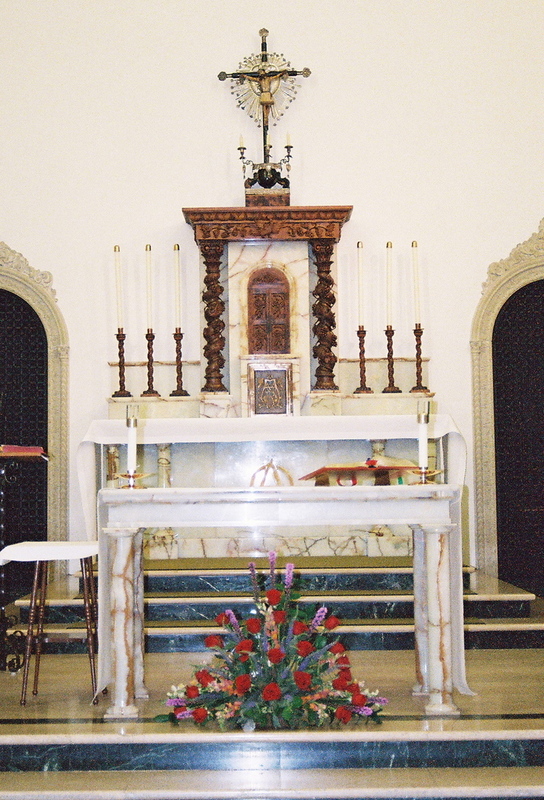 Meditations from Carmel: The site is from the Secular Carmelites (OCDS) in St. Louis, Missouri. The podcasts include meditations of 1.5 to 5 minutes in length, taken from the writings of the Carmelite saints. Pray as You Go: The site is from the Jesuits in Britain. The podcasts provide a new prayer session of 10 to 12 minutes for each day. The page also offers instruction in preparing to pray. Pray the News: The site is from the Carmelites of Indianapolis (OCD) who have provided the Pray the News website for a long time now. The podcast is new, and the first podcast is now available, on the subject of what praying the news is all about. From the Carmelite Monastery chapel in San Diego yesterday, here are a couple of photos from the Triduum of St. Thérèse. The memorial of St. Thérèse of Lisieux is October 1. 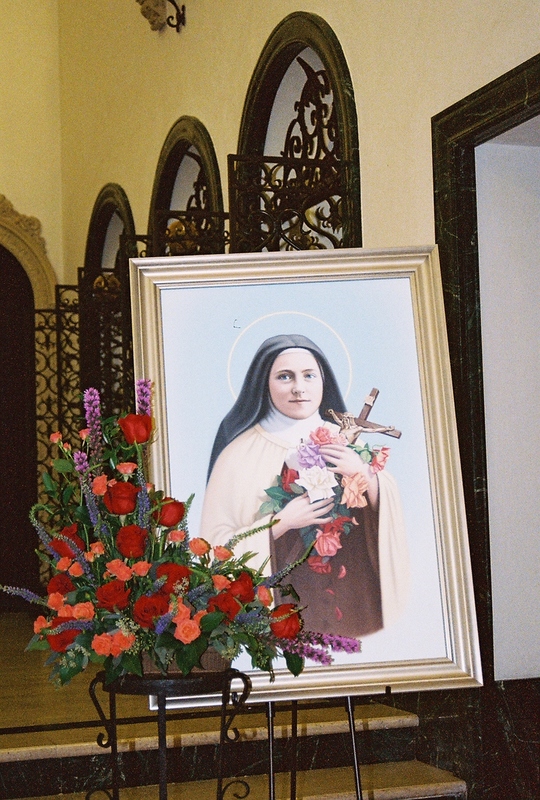 The Trumba calendar in the sidebar includes a couple of Southern California events to commemorate St. Thérèse. Closer to Los Angeles, St. Joseph's Conference and Evangelization Center has a St. Thérèse of Lisieux Pilgrimage one-day bus trip starting tomorrow morning at 7:30 a.m. in Alhambra. It may be too late to make a reservation for that if you have not yet done so, but there is more information on the Conference Center website. You can click on the Trumba calendar in the sidebar to see all the future listings. There are links to the websites of sponsoring organizations, which often have more information about the events. In San Diego, the Carmelite Monastery is having a Triduum of St. Thérèse each evening at 7:00 p.m. through Sunday evening. It started last night. I took a couple of photos, but they didn't turn out very good, so I will try to take more tomorrow or Sunday night. They have a visiting Carmelite priest, Father Adam Gregory Gonzales, OCD, from San Jose. Father Gonzales is celebrating Mass and giving the homilies each evening, and anyone is welcome in the chapel for these special Masses. "We are living now in an age of inventions, and we no longer have to take the trouble of climbing stairs, for, in the homes of the rich, an elevator has replaced these very successfully. I wanted to find an elevator which would raise me to Jesus, for I am too small to climb the rough stairway of perfection. I searched, then, in the Scriptures for some sign of this elevator, the object of my desires, and I read these words coming from the mouth of Eternal Wisdom: "Whoever is a LITTLE ONE, let him come to me.' [Proverbs 9:4]. And so I succeeded. I felt I had found what I was looking for. But wanted to know, O my God, what You would do to the very little one who answered Your call, I continued my search and this is what I discovered: 'As one whom a mother caresses, so will I comfort you; you shall be carried at the breasts, and upon the knees they shall caress you.' [Isaiah 66:13, 12] Ah! never did words more tender and more melodious come to give joy to my soul. The elevator which must raise me to heaven is Your arms, O Jesus! And for this I had no need to grow up, but rather I had to remain little and become this more and more." "As Carmelites, we are in prayer and we pray, but we ask all Christians worldwide to pray, as the Holy Land is loved by all and our communities are here at the service of all. "Pray that the situation will change and that the desired peace will finally come. 'It is an appeal we make with all our heart!'" She also mentions the rocket that landed on July 13 near the Stella Maris Basilica, and says that their phones have been ringing all day long. A Chicago Tribune news article from July 15 discusses the rocket attack that landed near the basilica and monastery compound.